We Make Your Outdoor Living Dreams A Reality! Specializing in Custom Decks, Porches, Patios, and More! Full 3D Rendering Free with Every Quote! Over 30 Years Experience Building Showpiece Living Spaces! Keystone Custom Decks is a patio and deck builder that creates our clients’ dream outdoor living spaces — right in their backyards. A true partner in your outdoor living renovation, we work to ensure your satisfaction from the initial brainstorming meetings, throughout the design phase, and to the end of the installation. With locations in Lancaster PA and Keuka Park NY, Keystone Custom Decks serves as one of the most well-regarded deck builders in Lancaster and Chester County PA — as well as upstate New York. As expert patio and deck contractors, we have decades of experience installing gorgeous decks, porches, screened-in-porches, patios, hardscapes, pergolas, railings, and more. To create truly luxurious outdoor living spaces, we complement our builds with a variety of outdoor living products, such as fire pits and fire structures. From our superior products to our installation process, discover what makes Keystone Custom Decks the Lancaster and Chester County Deck builder to know. Whether you envision building an awe-inspiring outdoor living space complete with a firepit, or a gorgeous screened in porch, we’re excited to make your dream a reality. At Keystone Custom Decks we have never built two identical projects — and we never intend to. Creating truly bespoke outdoor living spaces is our focal point as a deck builder, and that won’t change any time soon. Beyond our standout portfolio of projects, our design process is another aspect that sets Keystone Custom Decks apart from other local deck builders. When you team with our deck contractors, we help you fully realize your ideas, show you a realistic model with our 3D rendering services, and then bring it to life. Truly, Keystone Custom Decks is a porch and deck builder that welcomes your creativity — it inspires us, too! We provide a 3D rendering of your project along with every estimate. Our immersive design allows you to see your project design and color combinations in 3D — before you even sign the contract. Let’s get started! Our work is renowned among patio and deck builders for two reasons. One, because we build 100% unique showpieces decks, tailored to our customer’s vision. Two, because Keystone Custom Decks never compromises on quality — either in our building and installation process or with the materials and outdoor living products we use. We complement our backyard decks and porches with industry-best outdoor living products, firepits, and outdoor kitchens. Our unwavering commitment to quality extends from the very foundation of the deck or porch to the accessories we install. Simply put, when you partner with the best, you get the best. 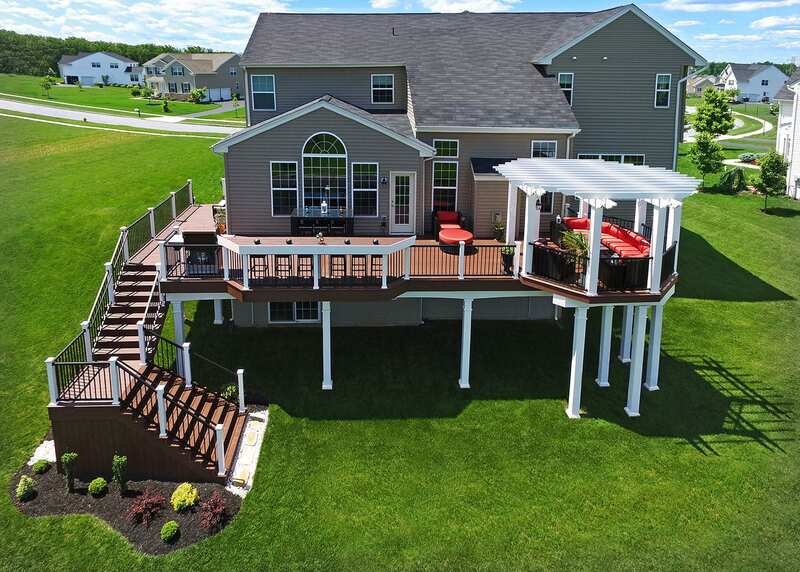 This dedication earns us a reputation as the Lancaster PA deck builder to trust for your dream backyard space. Learn about the superior vinyl and composite materials that are the foundation of every project we build. Building your ultimate outdoor oasis is a once-in-a-lifetime opportunity. We understand the importance of this project to you and your family, and we’re grateful that you’re considering Keystone Custom Decks. A standout outdoor living space becomes a centerpiece for how you and your family share meals, have fun together and entertain guests. You want your deck, patio, or porch to be flawless — and custom tailored to your needs and unique aesthetic style. We’re the custom deck builder who will work with you to realize your vision, refine it until it’s perfect, and bring it to life in your backyard. If you’re ready to learn more or want to discuss your ideas with a trusted Lancaster PA deck builder, start the conversation about your ultimate outdoor living space today.